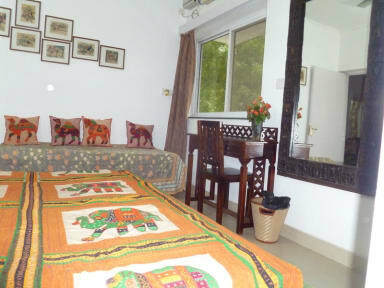 Maya's Nest is a Home stay style Bed & Breakfast Hostel. - Located in a very well guarded area, very safe specially for single women travelers. This budget accommodation is in a gated community in Vasant Kunj ' http://en.wikipedia.org/wiki/Vasant_Kunj'. A break away from the mayhem of Delhi. 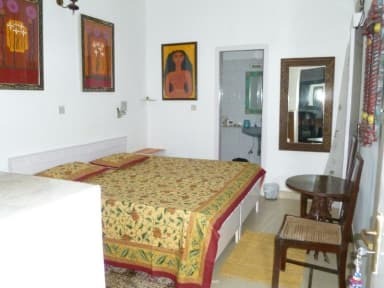 If you desire to spend less for a comfortable stay, still live in privacy, style, luxury and elegance, with very simple but very comfortable and immaculately clean rooms, running hot and cold water, western style toilets then Maya's Nest is your best option in New Delhi!! Very centrally located in close access to the various monuments and shopping spread over the colorful markets of South Delhi. The Bus stop is across the street while the metro is a five minutes ride. Cozy and relaxing common area enables all the guests to watch TV. read books from the Mini library and share their travel experiences, . The small business center with the facilities of photo copying, scanning, internet and printing is very helpful. Being a travel professional you are welcome to consult and book tours & tickets with Maya's Nest. Hi speed WiFi Internet covers all the rooms and other areas in Maya's Nest. We have a small dining room serving simple home cooked meals, normally Indian style, with organic vegetables, delicately seasoned and health conscious cuisines at a nominal cost. While food from other restaurants are just a phone call away. Home delivery menus are available through out the day, so you will never be hungry! A Yoga trainer is available. You can take cooking classes. Option of walk in the park next door or go for swimming in the vicinity. lessons.